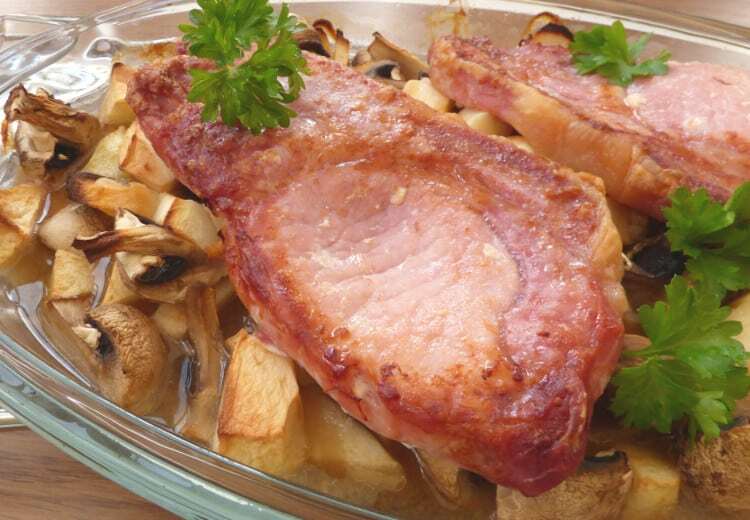 This oven bacon chop recipe is so easy – and bacon chops have so much flavour. 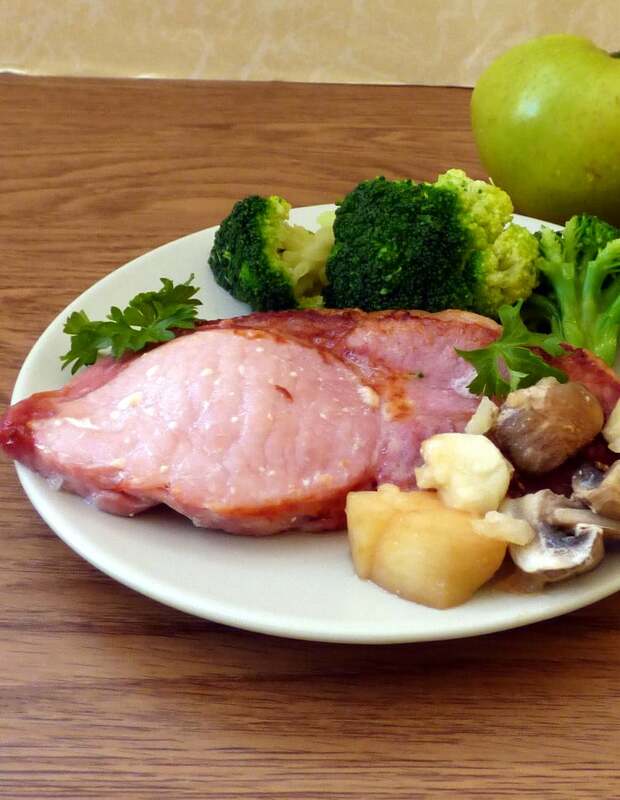 If you don’t have bacon chops available you could try this recipe with gammon steaks. Bacon chops, though, are one of the yummy reasons I enjoy shopping at my local butcher. To my mind, there is no reason to buy expensive processed meat when there are chops available. They’re the ultimate in convenience food- just whack them under the grill for 10-15 minutes. This, however, is a slower chop recipe. I had an apple left over from making apple pie, and some bacon chops in the freezer, and decided to see what would happen when I combined them. I must say, the result surprised me! Just peel and chop up a Bramley apple and scatter it into an ovenproof dish. Finally, slice a handful of mushrooms, and throw them in. Then place the bacon chops on top and put the dish in a hot oven for an hour, checking it once or twice in case it needs rotating. 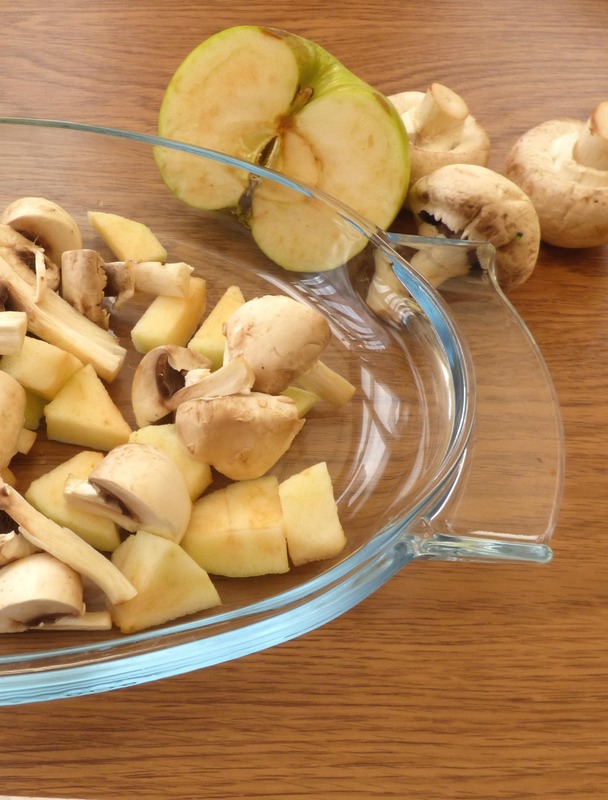 All those lovely juices soaking into the apple and mushroom – yum! The spectacular depth of flavour of this oven bacon chop recipe really threw me. It was so good I made it again very shortly after! If you use a small deep dish you may find the apple falls apart. However, if you use a flat dish like in the pictures the apple pieces may hold their shape but become delightfully smooshable. I’m sure something like a gammon steak would work just as well as chops. The more apple you have in relation to bacon, the more tart the juices will be. We served it with jacket potatoes. If you cook the potatoes in the oven with the chop, they may need 5-10 minutes of pre-cooking in the microwave. It also tastes great with vegetable couscous. If you like easy low prep dinners that cook in the oven try my Oven Pork Steaks with Satay Sauce. A tasty, low prep recipe with just 3 ingredients. 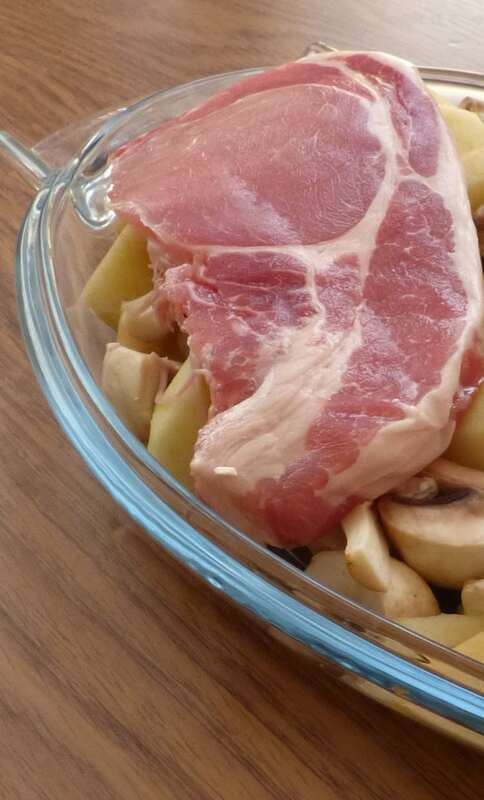 Place the apple and mushroom in the bottom of an ovenproof dish and lay the chops on top. What a lovely comfort meal~ I just love the pairing of pork with apples and your addition of mushrooms sounds fantastic! Thanks, I'm with you on the apples! OMG!!! Bacon Chop?!?!?! I have never heard of a such a thing but now my world has completely changed thanks to you! Heading to the butcher!! 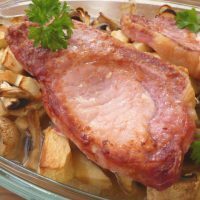 Love pork and apples together - this recipe looks wonderful (and super easy to put together - that's always a win in my book). Thanks for sharing! How easy and delicious! Yummy. I can not wait to make your pork chops, not only because they look so yummy but also because they are easy!! We happen to LOVE pork in our house. Pairing it with apples is so good. The perfect way to ring in fresh apple season...and comfort food too.